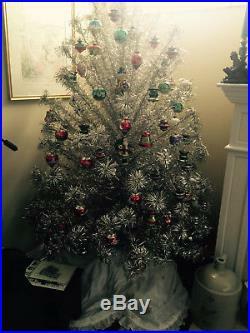 You have the opportunity to own a very rare and beautiful original vintage 6-1/2′ aluminum Pom-Pom style Christmas tree. All of the roughly 100 branches are intact. Please keep in mind that tape was used to affix the foil foliage to the aluminum stems. That tape has yellowed with age. The original aluminum tri-pod stand is not secure so I made one using a conventional Lowe’s holiday tree base and a special PVC pipe fitting!! It is very secure and included. We actually screwed this base to a HFT moving dolly when we had it up–sorry not included. The branches will support light glass ornament but not out at the tip. You’ll want to find a color wheel to really enjoy. All of the limb sockets are intact but you must be careful when putting up an heirloom like this. Let the children watch. Each branch is securely placed in a paper sleeve. 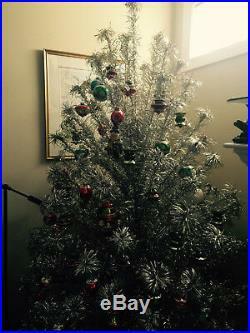 The item “VINTAGE 6-1/2′ ALUMINUM CHRISTMAS TREE With100+ BRANCHES & CUSTOM STAND/BASE” is in sale since Sunday, November 18, 2018. This item is in the category “Pottery & Glass\Pottery & China\China & Dinnerware\Lefton”. The seller is “mis455″ and is located in Rincon, Georgia. This item can be shipped to United States. Items must be in same condition and original packaging as received. 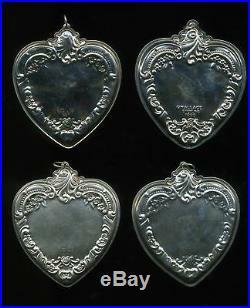 Items removed from encapsulated holders or cut out of factory sealed plastic are NOT eligible for return. 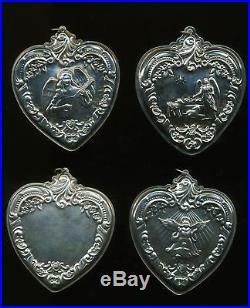 The item “Wallace Sterling Silver Christmas Tree Ornaments Hearts (Lot of 4)” is in sale since Wednesday, March 20, 2019. This item is in the category “Collectibles\Holiday & Seasonal\Christmas\ Current (1991-Now)\Ornaments\Other Current Tree Ornaments”. The seller is “cjrc1″ and is located in Bound Brook, New Jersey. This item can be shipped to United States.